Preuzmimo Benčić, Althea Thauberger, 2014. Photo by Milica Czerny Urban. Preuzmimo Benčić was shot with a cast of over 60 children between the ages of 6 and 13—all residents of Rijeka. 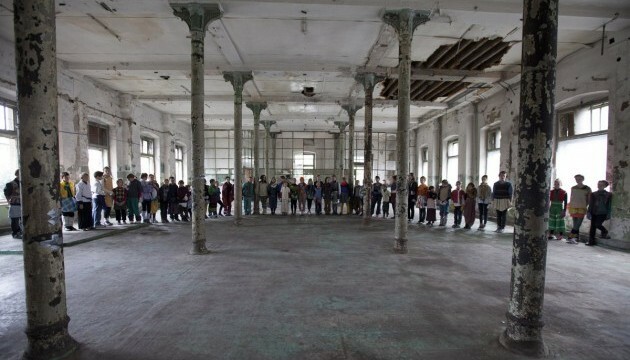 Filmed on location at Benčić, the former worker-managed factory in Rijeka, Croatia, Preuzmimo Benčić directly and indirectly tells the story of the former workers of the Benčić complex. In the film, they are granted permission to temporarily re-occupy the buildings as “artists.” While inside, their discussions and artistic work responds to cultural traditions, alternative social organization, possible uses of the building, the history of the city as told through the building itself, the difference between “the worker” and “the artist,” and the relationship between “play” and “work”. Their artistic work includes gestures, dance/movement, videomaking, music, ideas, and poetry/writing. Meanwhile, “the Mayors,” who wish to develop the heritage site into a municipal museum to reinvigorate the city with tourist dollars, are discussing their own plans. The story comes to a head in a debate when “the artists'” term expires, and the “the Mayors” come to the occupied building to discuss their own plans for the complex and kick out “the artists.” The dialogue is unscripted, improvised, startling, contradictory, and idiosyncratic. Of course, the story of the film is echoed by the actual situation of the occupation of the Benčić complex during production. With the support of the city of Rijeka, the film crew, and the families of the participating children, the children assumed occupancy of the buildings for approximately 5 weeks. Because many sessions of collaborative story development/research/rehearsal, exploration, play, and art/video production took place there, the kids developed a strong identification with the site over that time. This work draws upon improvisation, collective labour, and a fresh, hopeful perspective to circulate new stories about Benčić at a time when the future of the complex (and the city) is in question. *This text is a modified translation of a history of Benčić by Rijekan historian, Ivana Golob, written for Preuzmimo Benčić (Take Back Benčić). The original version was given to the actors to inform them of the history of the site. The area of Benčić has undergone numerous changes over the years. Formerly a green meadow in front of which was the sea, this place was turned into a thunderous factory that was silenced in the 1990s and to this day is still in silence. Way back in 1700. there were no sugar producers in this part of Europe and Croatia was not a country, but it was part of a larger state called Habsburg Monarchy. The authorities decided to start the production of sugar in the former Yugoslavia. It was a very successful factory, and the company itself, in addition to sugar, engaged in building and selling ships, imports of coffee, tea, tobacco, marine transportation, mining, exports of copper and mercury, as well as the production of fabrics. Then the sugar was produced from sugar cane, but when the world turned to the production of sugar production from sugar beets, the factory collapsed after nearly 85 years. However , the noise of industrial machines was not yet silenced in the area of Benčić because in the same space was soon occupied by a tobacco factory, also called Duhanjera. It was a government factory established in the Habsburg Monarchy, but during operation, the country changed several times. Over time, it was part of the Austro-Hungarian Empire; the Kingdom of Serbs, Croats, and Slovenes; the State of Serbs, Croats, and Slovenes; the Kingdom of Italy and Yugoslavia. This factory was in operation almost 100 years, even after the WWI and WWII, when it was destroyed in the bombing . After closing Duhanjera, the Yugoslavian government saw the potential in this area and opened a factory called Rikard Benčić. The plant was named after the inhabitant of Rijeka Rikard Benčić, a prominent fighter in WWII. This factory produced parts: turbines, marine shafts, telegraphs, ships’ steering gear and the like. In early 1990s, the factory fell into bankruptcy and after a year was closed, all employees were let go, and the machines fell silent. The City of Rijeka purchased the entire complex in 2000. Since then, negotiations for the building’s future has been under way. The plan is now to move the Museum of Modern and Contemporary Art and the Rijeka City Library to Benčić. It could become public spaces, galleries, and administrative spaces. Although everything seems positive, planning the use of these buildings has been going on for a long time, with frequent changes and associated scandals. Even though cultural facilities are supposed to be independent of the interests of any political party, changes in the political arena have heavy affects on the plans to develop Benčić as a cultural site. Althea Thauberger’s Preuzmimo Benčić publication is available in hard copy and as PDF download. Click here.